Home» AP LATEST UPDATES » AP SSA January Month School complex Level Meeting Scheduled as per RC.NO 846. 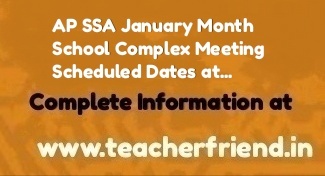 AP SSA January Month School complex Level Meeting Scheduled as per RC.NO 846. AP SSA School Level Complex Meeting January 2018 Subject wise Scheduled Dates as per RcNo:846/AP Sarva Siksha Abhiyan (SSA) SPS Nellore-Conduct of School Complex Level Meetings for the Month of January-2018 Guidelines for meetings to MEOs & School Complex Headmasters as per RcNo:846/A3,/SSA/20I7 Dated 18.01.2018/AP Sarva Siksha Abhiyan (SSA) SPS Nellore-Conduct of School Complex Level Meetings for the Month of January-2018 Guidelines for meetings to MEOs & School Complex Headmasters in the District Orders as per RcNo:846.
the teachers tor irnprovement of quality education (Schedule Enclosed). reports to the undersigned after completion of the programme. Dala.) in CSE Website in orescribed formats without fail. This should be treated as most important.